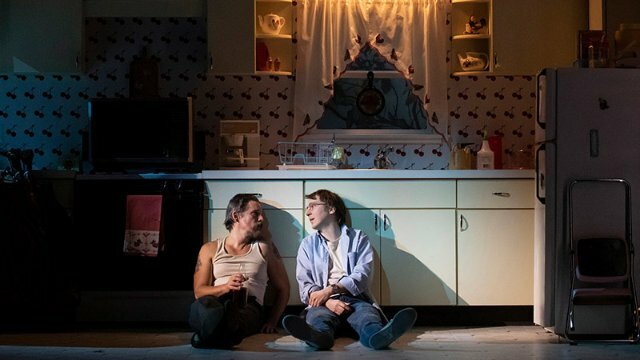 True West, Roundabout Theatre’s staging of the Sam Shepard play, stars two fine actors—Ethan Hawke and Paul Dano. It’s a play that descends from brotherly rivalry to rage and chaos, amidst a dozen toasters and piles of toast. And then Mom arrives home from vacation to her little tract house east of LA and her sons turn into little boys—briefly. I usually think of True West as a battle of brothers and equate it with similar rivalries and battles between my own two sons. But the current production—admirably directed by James Macdonald—strikes me as more a story about turning the American dream on its head. Austin (Dano), the younger brother, is a serious screenwriter working hard on a new film that he’s hoping to get produced. As the play opens, Lee (Hawke) has just arrived. He’s a drifter and has spent time in the desert. He’s filthy, dusty and tattered, and guzzling beer from the six-pack he brought. He’s at least mildly drunk, a condition he maintains throughout most of the play. Of course, there’s a large amount of money involved—to be paid when the script is delivered. And Lee needs a scriptwriter. Both he and Saul assume that Austin will write Lee’s script. And that sets off scenes of collaboration, warfare and chaos. Both Hawke and Dano deliver superb performances. My only quibble about the play is that Hawke’s Lee is not as scary as that character usually seems. His rages turn soft around the edges. But maybe that makes him a more realistic brother. When the tables turn, Austin, it turns out, has rage within. True West, written in nine scenes, is staged in two acts. Each scene change is marked by a full blackout and lighting framed around the proscenium of the American Airlines Theatre. The time setting of Shepard’s 1980 True West is ambiguous but it’s probably the ‘70s or early ‘80s—the era of typewriters and telephones with very long cords. (One funny scene has Lee tangled up in one.) Steppenwolf Theatre staged it at the St. Nicholas Theatre in 1982, starring John Malkovich and Gary Sinise, and then remounted it later that year at the Apollo Theatre. That’s where I saw it in the summer of 1982. My companion and I were sitting in the first row and got winged by a piece of toast. True West transferred to the Cherry Lane Theatre in the Village later that year. Shattered Globe staged a very good version of True West in 2016. Joseph Wiens was a fierce Lee and Kevin Viol the quieter Austin. True West by Roundabout Theatre Company runs only through March 17 at the American Airlines Theatre on Broadway. If you‘re in New York this weekend, you might still be able to get tickets. The play runs 2 hours and 15 minutes, with one intermission. Courtesy of Third Coast Review.